Update: PlayStation Vue is now available on PC and Mac via the web! Click here to get started. The device options for PlayStation Vue are expanding with some highly requested platforms. We’re pleased to announce that you can watch your favorite TV shows, movies, and sports through PlayStation Vue on Android TVs starting today. Additionally, web support for both PC and Mac is coming soon. You can sign up for PlayStation Vue via the web for these two new devices without the need of a PlayStation console. 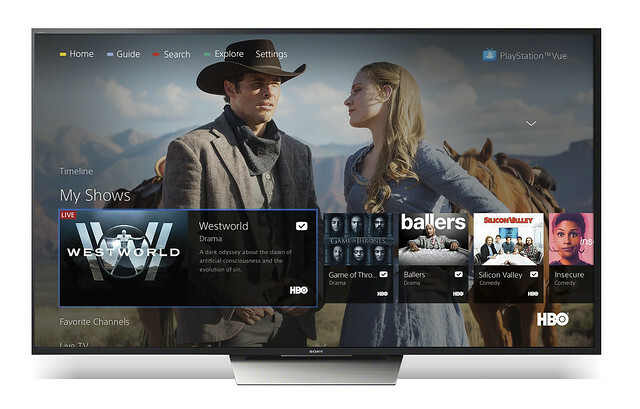 If you already have a PS Vue account, you can begin streaming your favorite TV content starting today by downloading the PS Vue app on Android TVs running Android OS 4.4 or higher. If you’re new to PS Vue, you can sign up for a seven-day free trial through the PS Vue website, then link your account to your Android TV. We have a variety of plans available for you to choose from, including our new Ultra plan with HBO and Showtime. Access: 55+ channels, including live cable TV, movies, and sports channels for $29.99 per month ($39.99 in cities with major live local broadcast stations*). Core: 70+ channels, including all the channels from Access with the addition of live national and regional sports networks for $34.99 per month ($44.99 in cities with major live local broadcast stations*). Elite: 100+ channels, featuring all the channels from Core with the addition of top movie and entertainment channels for $44.99 per month ($54.99 in cities with major live local broadcast stations*). Ultra: HBO and SHOWTIME, plus all the 100+ channels from Elite for $64.99 per month ($74.99 per month in cities with major live local broadcast stations*). Coming soon, PS Vue users can access the service on PC and Mac devices. This will include some unique features, such as a “mini-player,” which allow you to shrink the player to the corner of the browser window and continue browsing PS Vue for a convenient experience. Stay tuned for information on a launch date. The addition of Android TVs, and PC and Mac support coming soon, adds to our growing list of popular PS Vue compatible devices such as PS4 and Roku, as well as iOS and Android mobile devices. Remember, you can simultaneously stream PlayStation Vue content on up to five devices. You can also take advantage of PlayStation’s Vue innovative cloud-based DVR to record hundreds of shows at once with no scheduling conflicts. We’ll continue to provide updates and more information on PS Vue, so stay tuned to the blog or check out www.psvue.com. Wao even in Android Phones…. What about Vita!? Ia not a Playstation brand console anymore !? No link to the play store page? I was tired of Side-Loading the Mobile app on my Nvidia Shield TV, finally I’ll be able to use the remote instead of the game controller! Looking forward to the PC info too! AppleTV support and add CW and CBS to all markets. That’s what it will take for me to sign up in an instant. Vue on Apple TV would be great. It’s already on iPhones and iPads. I finally just bought a Fire TV because a ) it has Vue, b ) it has the CW app so I can watch the 5 most recent CW episodes of all shows, c ) refurb units only cost $80 on Amazon and d ) my wife hates the PS3 and PS4 media remotes. So many resources put towards a feature that is only available to a minority of customers. You get that this is a brand new business paradigm which only a small handful of companies have tried to launch, right? This is something that they have to negotiate different contracts/rights with hundreds of different providers (maybe thousands), and even then all of it is geographically regional. This is a MASSIVE undertaking for any company, and they’re having to take the time to grow this business while being trailblazers. I wasn’t interested when it first launched in my region, but they have added enough partners and features that I’m completely sold. I was able to cancel 8 different streaming services, just keeping Netflix, and save a few bucks every month while gaining a TON of content all under one service/app. “only available to a minority of customers”? PlayStation Vue is available nationwide in the U.S. YES!!! I’ve been waiting on this goodbye Directv.com hello Playstation Vue. I know they dont read this or even provide feedback but hell it makes me feel better to say it. Where is the Apple TV app? OMG I am loving this constant PS Vue updates! keep them coming. Been a customer since I had a preview at PSX last year and got that amazing offer! Hope to see you guys at PSX again this year! You guys specifically mention PC & Mac support through the web. Does this mean that it won’t work on something like a Chromebook through the web? Thanks so much guys! Been waiting to try vue and this is what i needed! I’ll gladly cut cable and subscribe when you get Seattle local stations. I hope they add Vue to LG WebOS then I can ditch my Roku. Definitely glad to see web support should be coming soon. While it’s been nice to sign-in to channels that have their own streaming setup, sometimes those setups are sub-par or have issues, and I can’t just get at everything from one interface. Any chance CW channel could be coming to PS Vue? The service is damn near perfect except for the fact that missing CW. I’d settle for a CW PS4 app too. Where’s the Apple TV app? I love Vue, but this is really needed. I just love how Vita/VitaTV is simply ignored as if it doesnt exist. such a missed opportunity. I’m shocked at how much they botched PS TV, especially since they knew where they were going with Vue. They need to try again and make an incredible set top box. PlayStation TV would be the perfect way to watch PlayStation Vue! I can’t believe Sony would rather see people buy a Roku or Amazon Fire TV instead of their own device. I want playstation TV support! Give me that and A&E/History programming and I will never ever stray Sony! When is this going to be in Canada? Not for a long time. Less population, lest infrastructure, and they would need to sign new contracts. Any idea of if/when Vue will come to Samsung TVs? Would love to access view using my TV’s software as running my PS4 constantly is pretty power hungry and causes heat build up in my system. Would love this integration. I too am looking forward to a Apple TV app, its really all thats missing IMO, im using Vue on my TV with a Fire TV now and its great but I need to get Vue in my other room and a Apple TV is in there. Im really not looking to buy another device at this point. 1. 4K support. Many cable companies have already rolled out 4K DVRs. 2. Where are the big 3? NBC, ABC, CBS. I’m sure there is some fight between the cable companies and broadcasters, but this needs to be worked out. 3. How about a discount for Plus members? Sony, what are your plans to deliver 4k content ? I also need more than 2 local channels before I switch…. 1. there is almost no 4k TV content and with Comcast giving a lot of us 1TB monthly limits I don’t want to stream 4k anything. 2. They already have ABC, NBC and FOX on demand – Some markets get live ABC, CBS, NBC and FOX. 3. They have Plus discounts on ad-on channel packages. Completely agree. Need Lifetime and A&E before I can try Vue again. Yeah, the only thing they’re missing (besides local channels) is A&E, which also owns History and Lifetime. But still, I’m impressed that Sony managed to get pretty much every other cable channel on board. Thanks you added NESN and Android TV, the last thing I need is local Boston ABC NBC FOX and we are Platinum. I might just be tempted enough now to get an OTA antenna for those and go VUE! None of the content is broadcasted in 1080p, only 720p or 1080i. Playstation continues to impress me – this is huge! Awesome work! So glad it’s coming to PC, been wanting this is it first launched! Can’t wait, wish it was already here tho. Apple TV Support please. It’s the last major platform your not on yet. 1080p steaming would be a nice addition also. Apple TV please. I’ve been patient. I’m about to jump to Sling and/or wait to see what ATT (directvnow) has to offer next week. This is great news but a small request. Get the REAL story about AppleTV support out there. The Internet is claiming shenanigans by Apple; Sony not wanting to because they hate Apple; Developers not knowing HOW to develop for AppleTV and even that the CIA have told PlayStation not to. I can understand the people that want the networks and I agree, but like me I want an option to keep my $30 without the networks. I use them some, but I have an antenna and can get them free currently. Another $10 keeps moving me back toeards cable prices. Any news on if Apple TV will ever be supported? Yes please come to Canada! Please add some more Spanish channels; at least CNN en Espanol. They offer an Espanol Pack. $5/month ($4 with PS+) for 10 channels, including CNN. Can those of use can get local channels via antenna, not have it include with the price and get a discount? So. that all fine and dandy your eco is expanding. Wahoo. but what is Vue team doing to improve the GUI of Android/Fire TV/Android TV app (which I have on all 3 platforms + PS4). Compare to PS4, the menu is laggy, slow, and extremely buggy. Is the team going to address this soon or 20-never? Why Sony leaves support out for their own systems is way beyond anything logical. I have a vita and Playstation TV I want to switch to this service I like it alot on my PS4 but need to buy Amazon Fire TV to get similar experience on my other tvs meanwhile I have two PlayStation TV devices that are not supported which I already spent $100 dollars on, makes no sense. I will be waiting for support for these devices before I switch. Why won’t you let me stream from multiple PS4s on the same home network!!! I have a PS4 now but its in the main room i have other rooms that wanna get a ps4 for but i cant because Im only allowed to stream from 1 ps4 even on the same home network. I had to buy a ps3 just to be able to do it but i dont even play any games on it!!! Almost started PC/Mac today. Apparently it was set to go but there was some kind of hangup and they had to delay. Good news we are almost there for PC and Mac. I just tried the PC app out and it almost brought tears to my eyes, I was so happy that it was via browser and it seems to work great. Especially after beating the desk many times previously trying to deal with a firestick and all that. What a mess. But then first glitch, a major one. One of my main, of the few channels I need, NBCSN has the content I need web restricted. Lovely, back to the fireassstck experience for that. PVue get this straightened out. I will be emailing nbc about this also although who even knows if those get through. I can’t wait for the day when all of these power, control and money freaks (gov’t and all of their protected buddies) are sent to where they belong and we can have our lives back. Apparently the PC/Mac app is still not fully implemented so this may be why there has not been an announcement. Hopefully if there are any problems with it they will be fixed before the official rollout. Apple TV APPLE TV Support please, best device in the market, a company like Sony, how hard is it to make an apple TV app, do it b4 hulu and Direct TV comes out……….. Thank you so much for adding support for the NVIDIA Shield!!!!! Any updates to MLB or NBA networks coming to PSVue? Although PVue is saying that this is not officially working (PC app) I am able to use it. I had to have my zip code location reset as it thought I was mobile, but now the content is available to me. So glad to now have my PC app to get away from the poorly operating, for me, firestick and wireless. I’m happy that Vue is finally available for Android TV, but the program Guide screen is very, very sluggish on my Sony XBR55x850c 4k TV. It’s almost unusable. I have also have a PS4, and scrolling through the Guide screen is comparatively very smooth. Can you please improve performance? The 2015 Sony TV’s were very under-powered as far as the smart interface goes. I don’t think you have much to hope for improvement. If you plan to utilize the service frequently …. get an external device like the Nvidia Shield that Vue will run on. Even an Amazon Fire TV would probably give better performance. @PLY17410 I don’t buy that argument. The Netflix app is snappy, so is the SlingTV app. And both of those use either images in the guide, whereas PS Vue is just a text table. Not only that, but the SlingTV app plays video in the background with the guide is overlayed in a transparent layer. The app just needs performance improvements.